Not due to be formally unveiled until Monday, just before testing kicks-off, the Alfa Romeo has made its track debut at Fiorano this morning. Sporting a black and red temporary – at least we hope its temporary – camouflage livery, the car was driven by Kimi Raikkonen. With Ferrari and Haas both scheduled for shakedowns at the track over the next couple of days, photographers – amateur and professional – along with fans have made the trip to the Ferrari test track in order to see them before they make their debuts at Barcelona on Monday. 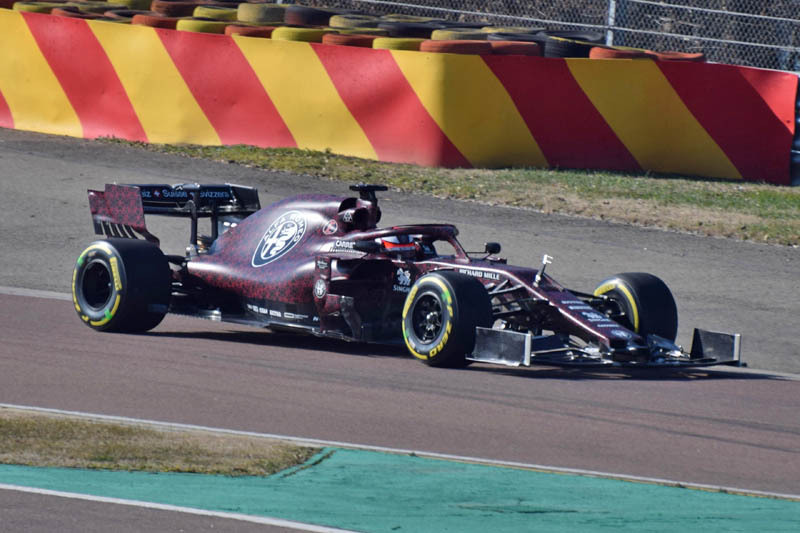 Being that today is St Valentine’s day, the camouflage livery features black hearts and Alfa’s famous cloverleaf (quadrifoglio) on a dark red background.